Definition at line 87 of file llhttpclient_tut.cpp. Definition at line 90 of file llhttpclient_tut.cpp. References mClientPump, mPool, mServerPump, NULL, and LLHTTPClient::setPump(). Definition at line 99 of file llhttpclient_tut.cpp. References mClientPump, mPool, and mServerPump. Definition at line 158 of file llhttpclient_tut.cpp. Definition at line 147 of file llhttpclient_tut.cpp. References llformat(), mSawError, and mStatus. Definition at line 166 of file llhttpclient_tut.cpp. Definition at line 134 of file llhttpclient_tut.cpp. Definition at line 226 of file llhttpclient_tut.cpp. References tut::HTTPClientTestData::Result::build(), LLSD::clear(), mResult, mResultDeleted, mSawCompleted, mSawError, and mStatus. Definition at line 114 of file llhttpclient_tut.cpp. References LLPumpIO::callback(), LLTimer::hasExpired(), mClientPump, mSawCompleted, mServerPump, LLPumpIO::pump(), and LLTimer::setTimerExpirySec(). Definition at line 106 of file llhttpclient_tut.cpp. References LLHTTPRegistrar::buildAllServices(), LLIOHTTPServer::create(), mPool, mServerPump, and LLHTTPStandardServices::useServices(). Definition at line 223 of file llhttpclient_tut.cpp. Definition at line 143 of file llhttpclient_tut.cpp. Referenced by HTTPClientTestData(), runThePump(), and ~HTTPClientTestData(). Definition at line 141 of file llhttpclient_tut.cpp. Referenced by HTTPClientTestData(), setupTheServer(), and ~HTTPClientTestData(). Definition at line 174 of file llhttpclient_tut.cpp. Definition at line 176 of file llhttpclient_tut.cpp. Referenced by getResult(), newResult(), and tut::HTTPClientTestData::Result::result(). Definition at line 177 of file llhttpclient_tut.cpp. Referenced by newResult(), and tut::HTTPClientTestData::Result::~Result(). Definition at line 175 of file llhttpclient_tut.cpp. 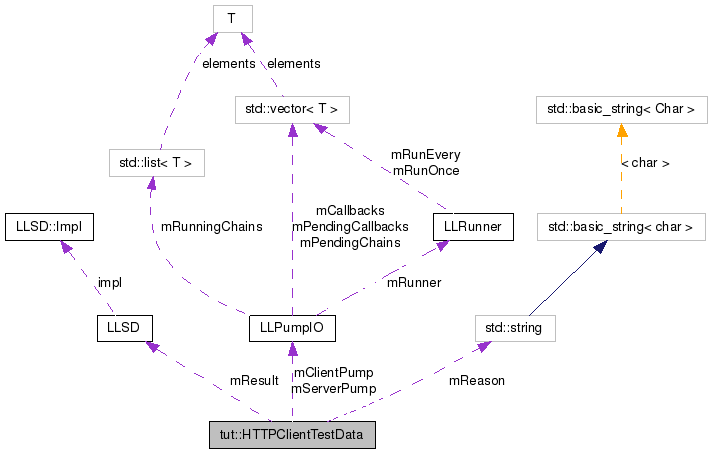 Referenced by tut::HTTPClientTestData::Result::completed(), newResult(), and runThePump(). Definition at line 172 of file llhttpclient_tut.cpp. Referenced by ensureStatusError(), ensureStatusOK(), tut::HTTPClientTestData::Result::error(), and newResult(). Definition at line 142 of file llhttpclient_tut.cpp. Referenced by HTTPClientTestData(), killServer(), runThePump(), setupTheServer(), and ~HTTPClientTestData(). Definition at line 173 of file llhttpclient_tut.cpp. Referenced by ensureStatusOK(), tut::HTTPClientTestData::Result::error(), and newResult().